Known as the “King of Terriers,” the Airedale Terrier represents the finest features of the terrier group. 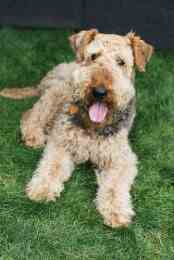 Airedale Terrier puppies and dogs are independent, energetic and have untiring courage. They can be initially suspicious of strangers and territorial. These large terriers have a long, flat head that couples with their deep chest and harsh, wiry coat for a uniquely attractive look. This breed of well-balanced dogs stands square with a level top line and very straight front legs. When trained as a watchdog, the Airedale Terrier is unbeatable for its size and weight.